The Secrets of Negative Training That Nobody Else Can Tell You - Dropping Points, Partial Negatives, 2 Up/1 Down and More! training techniques will take your gains through the roof! Apply the workout wisdom, take massive action, achieve Massive Results. Want to gain strength rapidly? Negative training is by far one of the best ways to dramatically increase your strength levels as quickly as possible. And the standard ways to do negative training can certainly be effective...but who wants standard results! The term "negative" refers to the lowering portion of a repetition. For example, when you do a bench press, pushing up the bar is the "positive" phase (also known as the concentric phase), lowering the bar down to your chest is the "negative" phase (also known as the eccentric phase). When we talk about negative training, we're referring to training that focuses specifically on working only in that lowering phase of each rep. Because your muscles can handle heavier weight when you're lowering a weight in a controlled manner than when you're actually lifting it up, we use a heavier amount of weight for negative training. The heavier weight helps build muscular strength and develops the connective tissue (tendons and ligaments), conditioning your body to then train with heavier weights than it would normally be used to training with. Negative training holds the potential for building TREMENDOUS strength. Typically, negative training is done with a training partner. The partner helps lift the weight to the top position, then the partner releases the weight and you lower it to the bottom solely on your own power. The real key to effective negative training is in HOW you lower the weight. Don't just lower the weight as you would in a typical rep, letting it come down on its own. You must ACTIVELY FIGHT GRAVITY by pushing (or pulling, depending on the exercise) as hard as you can against the weight. It's heavier than you can actively lift, so all you will be able to do is slow it down. If you don't fight the weight, your results will not be optimal. If you've done negative training before and didn't feel extremely sore the next day, you probably weren't fighting the weight during the negative phase. Try it and you'll feel the difference! It's not an easy workout technique and it shouldn't be done very often (because it causes a lot of muscle damage) but it is EXTREMELY effective for building strength quickly. It should also be done only AFTER you've had at least 6 months of training experience. So What Are These Secrets Of Negative Training? Now we come to the juicy stuff...the stuff that you won't learn anywhere else. This information will help you make full use of negative rep workout and truly maximize the results you get from it. Because if you're doing negative training the standard way, you are simply NOT getting everything out of it that you could be. If you've been lifting weights for any length of time, you're intimately familiar with sticking points. The sticking point is the point in a range of motion of a given exercise where, as you fatigue, the weight just stops. For example, on the bench press, the sticking point is just below the halfway point of the press. At this exact point, the structure of your body causes a change in leverage, making it the weakest point in the range of motion (every exercise has a unique strength curve with a unique sticking point). So naturally, when you're doing negative training, this weakest point in the range of motion still exists. Picture it this way...you have a weight that is greater than what you can normally press - in the top, strong range of motion, you can lower it under control very easily. But when you get to what I call the "dropping point" (which is the equivalent to the sticking point), your leverage changes and your strength suddenly drops (as does the weight, hence the name "dropping point"). Here's the problem...with standard negative training, you can only use enough weight that you can control through the WHOLE range of motion (if you use more, the weight will just crash down when you hit that dropping point). But if you can control 250 lbs at the dropping point, you can control FAR more than that up until the bar gets to that point, possibly 300 lbs or more. This means you're NOT fully overloading your muscles and NOT getting the most results possible with your negative training. You're only overloading the weakest point in the entire range of motion of the exercise and the rest is just wasted. The reason you're doing negative training is to build strength - why use only what you can control in the very weakest point in the range of motion? Standard partial training is basically doing an exercise in a shortened range of motion. Using the bench press example, it could be doing only the top few inches of the exercise, locking out with the weight. The primary benefit of partial training is the ability to use MUCH more weight than would with a full range of motion. 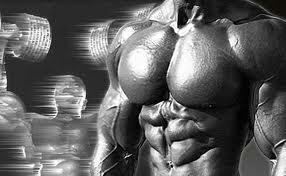 The concept of partial training can very easily be carried over to negative training and applied with great effect. To do partial negative training for the bench press, we're going to set the safety rails in the power rack just ABOVE the dropping point of the exercise. That way, you can use FAR more weight - you won't have to base the weight that you're using on what you can control through the weakest range of motion. You'll base it on what you can do in the top, strongest range of motion. The result: much greater strength gains and MUCH greater effects on the connective tissue, helping pave the way for even better gains in the future (stronger connective tissue gives the muscles greater potential for strength gains). This partial technique can applied to almost any exercise that has a dropping point/sticking point and that can be done with free weight in a power rack, e.g. squats, presses, curls, barbell rows, etc., or even using machines that can be adjusted in terms of range of motion. With the rack, all you need to do is determine where your dropping point is and set the rails just above it. But what do you do if you don't have a partner or a power rack? How can you even do negative training at all, much less avoid the pitfalls of the dropping point? The answer is simple: do the positive phase of the exercise with BOTH limbs and do the negative phase with ONE! This solution is elegant in its simplicity - a weight that is enough to challenge one side of the body will be fairly easy to lift into position with both. Dumbells and machines are most appropriate for this type of training. Machines are especially useful because a machine that is designed for two arms can generally be very easily done with just one with no changes at all in body position or technique. Take, for example, a shoulder press machine. To do a 2 up/1 down negative, place a little more weight on the machine than you could do for a regular rep with 1 arm. Press it up to the top position with both arms then take your left hand off the handle. Lower it to the bottom with just your right arm. If you're using a dumbell (for example, on a preacher curl bench), hold onto only one dumbell and use your other hand to help move the dumbell back up to the top position after each negative rep.
First, the uneven tension on the body forces the stabilizing muscles of the core to work overtime. You'll develop great core stability even while using machines, but especially when you're using a dumbell. Second, if one side of your body is stronger than the other, the stronger side won't be able to compensate for the weaker side, ensuring more even development. Third, and this relates most to the dropping point, your non-working limb can be used to spot yourself on the negative phase of the rep. If you're doing a dumbell preacher curl negative, you can use your other hand to apply some additional pull (gripping on your forearm or hand) and help take up some of the resistance when you get close to the dropping point. This means you'll be able to use maximum resistance in the strongest ranges of motion and get some help in the weakest range of motion so that the weight doesn't drop and you lose the tension. Negative training is one of the best techniques you can do for increasing strength quickly and powering up your connective tissue. When doing negative training, because of the way it damages muscle tissue, it's a good idea to increase your intake of Vitamin C to help reduce muscle soreness and rebuild damaged muscles (take 500 mg before and 500 mg after your workout). Negatives are not for the beginning trainer, but can be extremely valuable for the intermediate to advanced. They should be performed a maximum of only once in a week for any given muscle group and for no more than 3 to 4 sets of 4 to 6 reps (if you can do more than 6 reps, you're not using enough weight). Give negative training a try using the partial technique or the 2 up/1 down technique. It'll take your strength to a whole new level! Brought to you by Rock Body Fitness . Striving bring you the best and most effective workout training methods, so you can get Maximum Results in Minimum Time.